Fairhope Brewing Co.’s brews are now available in bottles! Join the brewery in celebrating this milestone on Saturday, July 18, in the taproom for its second annual Mardi Gras in July. Truly, Fat Tuesday is too big to come only once a year, so the creative folks there have labeled this event Fat Brewsday. The event will begin with a pet adoption at 2 p.m., with critters provided by the Baldwin County Humane Society (BCHS). There’s no time like the present to take home that fluffy feline or droopy-eared dog. These guys need homes, and beer drinkers shouldn’t drink alone. Let BCHS make the adoption process easy for you as you find your perfect match. 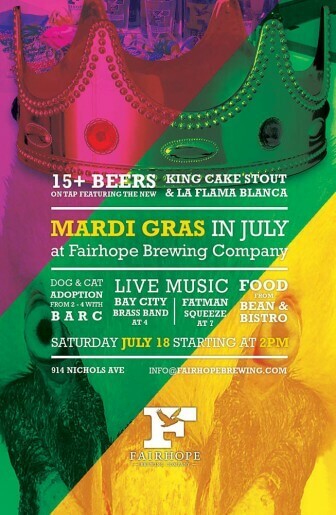 Music, pet adoptions and beer are reasons to celebrate Mardi Gras in July at the Fairhope Brewing Co. Saturday. Fat Brewsday will also see the release of Lil Poison Ale. As Grayson Capps preaches in song, we should all “drink a little poison” before we die. Now is our chance. But the brews do not stop there. Fifteen specialty beers will be available, with wild flavors involving moon pie and the delicious King Cake stout. These are far cries from the popular Everyday Ale and Fairhope 51 that make their rounds in every craft beer bar worth its salt in our area. At this event we get to see these guys stretch their legs a bit. If it’s Mardi Gras, you can’t live on beer alone. One must have food to keep the good times rolling, and street food is the way to go. Fairhope’s popular Bean and Bistro will be on hand serving up this type of fare, so bring an appetite. What would Mardi Gras be without live music? The Bay City Brass Band will get your heart pumping the way only they know how at 4 p.m. At 7 p.m., Fat Man Squeeze will take the Taproom stage for some raucous acoustic music and a couple albums’ worth of new tunes. It sounds like this is shaping up to be the party of the summer. The Alabama Alcohol Beverage Study Commission will hold a public hearing Thursday, July 16, at Government Plaza beginning at 2:30 p.m. It will be the first of three scheduled hearings statewide and the only in South Alabama. This will be a chance for the public to hear and discuss proposed changes to the oft-restrictive Alabama alcohol laws, and more specifically how the changes could affect craft beer in our state. We have seen a little bit of relaxation and legislation that loosens the collar, so to speak, on the bottling of beer and the opening of breweries such as the aforementioned Fairhope Brewing Co., but some of the laws in Alabama make Mississippi look like Milwaukee. Hopefully we’ll see changes soon that can pave the way for Alabama breweries to achieve the kind of success Lazy Magnolia of Kiln, Mississippi, is enjoying, along with the many other bottles and cans brewed by our neighbors to the west. I personally can’t identify why you may not purchase a quart of beer in Alabama. You can buy a 24-ounce beer, but not a 32- or 40-ounce beer. You’re not allowed something that equals less than three beers, and therefore must either purchase a single beer or a six pack. It seems like such an odd thing to ban. Our college students must go out of state or bootleg to play a friendly game of Edward Fortyhands. My favorite fruit, favorite snow cone flavor, favorite homemade ice cream, lip gloss and Jolly Rancher flavor is peach. Right now is the time to go peach crazy as the fruits are as sweet as they’re going to get. The Chilton County peach fest has come and gone with the end of June, and although those things are beautiful you don’t have to be from Chilton County to be a peach of a peach. Roadside stands, farmer’s markets and even run-of-the-mill grocery stores are stocking some amazing peaches right now. My kids are going crazy for them. Do yourself a favor and make yourself a peach cobbler with homemade ice cream on top. I don’t care how hot it is outside. A cobbler with fresh peaches is one of life’s treasures. Celebrate the peach. Recycle the pit. 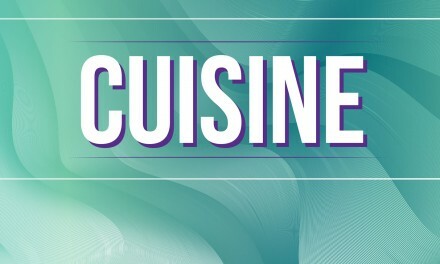 According to Chef John Weichman, Friday’s scheduled wine dinner at Bistro Escoffier will have to be rescheduled due to a family emergency. We’ll provide more information as it is available.